Anthoxanthum hirtum (Northern Sweet Grass) | Plants of the Northeastern U.S.
Synonymous with Hierochloe hirta (Schrank) Borbás which was historically often lumped with H. odorata (L.) P. Beauv. which is now recognized separately as Anthoxanthum nitens (Weber) Y. Schouten & Veldkamp. Moist soil, meadows, shores, bog margins. Circumboreal, south to NJ, MD, OH, IA, and AZ; considered to be introduced in New England. Herbaceous perennial, vigorously rhizomatous, the stems produced singly or few together from the elongate rhizomes; inflorescence an open panicle 4-9(-12.5) cm tall, with 8-100 spikelets; glumes subequal in length, (2.5-)3.5-6 mm long; spikelets with 1 bisexual floret and 2 staminate florets each; staminate florets unawned or with short awn-tips to 0.6(-1) mm long; pubescence of lemma of bisexual floret loosely ascending, 0.5-1 mm long, more or less uniformly distributed around the apex of the lemma. 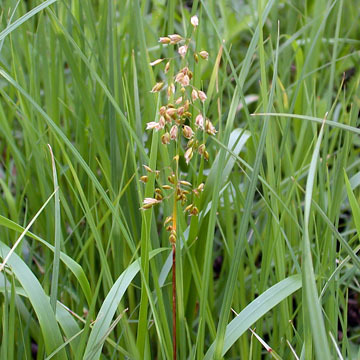 Anthoxanthum nitens is similar but has shorter (0.1-0.5 mm long), appressed to appressed-ascending pubescence on the bisexual floret that tends to be concentrated near the keel and rather sparse near the margins. Anthoxanthum monticola (Bigelow) Y. Schouten & Veldkamp is circumboreal in arctic and alpine meadows and ranges south to alpine summits of New England and NY; it has shorter rhizomes and appears subcespitose and has staminate florets with awned lemmas (0.6-10.5 mm long), longer glumes (5-8 mm), and moderately compact panicles that are shorter (1-8.5 cm) and with fewer spikelets (mostly 10-20).